I have a small addiction to all things “cranberry bliss”: cranberry bliss bars, cranberry bliss fudge, cranberry bliss cupcakes, cranberry bliss pinwheels. It’s just at the holidays where I need to cram all the cranberry blissy goodness into two months time. I don’t have a problem. I SAID I DON’T HAVE A PROBLEM. This is most definitely the easiest recipe I have on the site that emulates the flavor of Starbucks’ famous holiday treat. You only need 20 minutes before you can dive in and accidentally on purpose eat it all. P.S. : I make so many cranberry recipes over the holidays, I find it worth it to buy cranberries in bulk. Same goes for white chocolate, and my personal favorite is Ghirardelli white chocolate chips. Highly recommend. 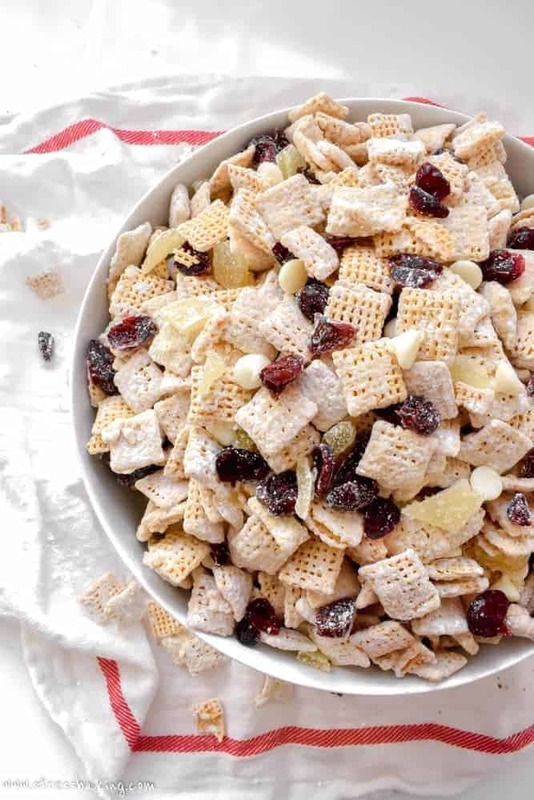 Unlike traditional puppy chow, there’s no peanut butter or chocolate present – just white chocolate to coat the Chex mix pieces, and then coated in powdered sugar. However, the white chocolate gets the addition of orange extract and ground cinnamon to ensure it’s sticking to every piece. You’re going to want the biggest bowl you can find, because it gets more and more challenging as you add ingredients. If you watch the video in this post, you’ll notice that I most definitely need a bigger boat. I mean, bowl. Maybe I should add that to the wedding registry. Of which, according to my little countdown calendar thing on my phone we only have 91 days until the wedding. Sweetbabyjesus, it’s comin’ up quick. But you know what? I’m not nervous about it at all. There’s no stress, no nerves, no worries. I’m just excited, because we’re treating this like a big party with a bunch of our favorite people. Speaking of parties, bring this to the next one on your calendar and watch how quickly you become everyone’s best friend. Fair warning: You’ll then be asked to bring this to every party you attend from here on out. It’s a delicious burden to bear. HAHA I was at Starbucks the other day and almost got a Cranberry Bliss bar. This sounds like a great plan for movie night. Perfect for watching all the holiday movies. 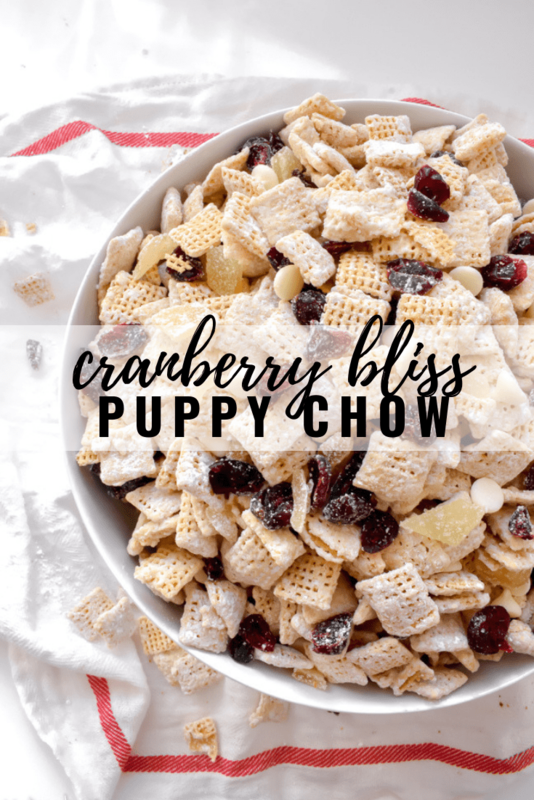 I never really understood the appeal of puppy chow until I had I actually ate some! Talk about yum!! You cranberry bliss version looks so delicious with the cranberry, ginger and orange!! Puppy chow! My daughter used to make this all the time when she was in elementary school. It was the perfect treat to bring to her classmates. While I secretly snuck away handfuls of the delicious stuff. 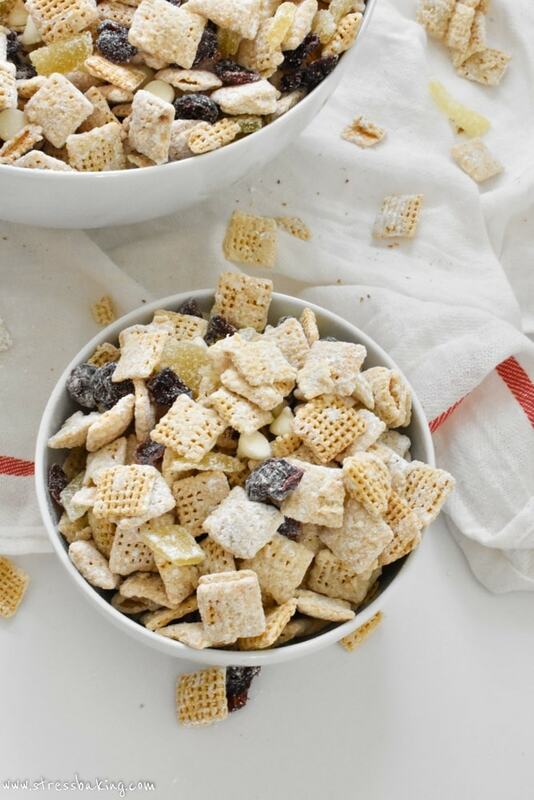 The addition of cranberries is interesting, a tangy twist on a super sweet treat. What a FUN recipe! My kids will be all over this! And that orange peel addition….YES! 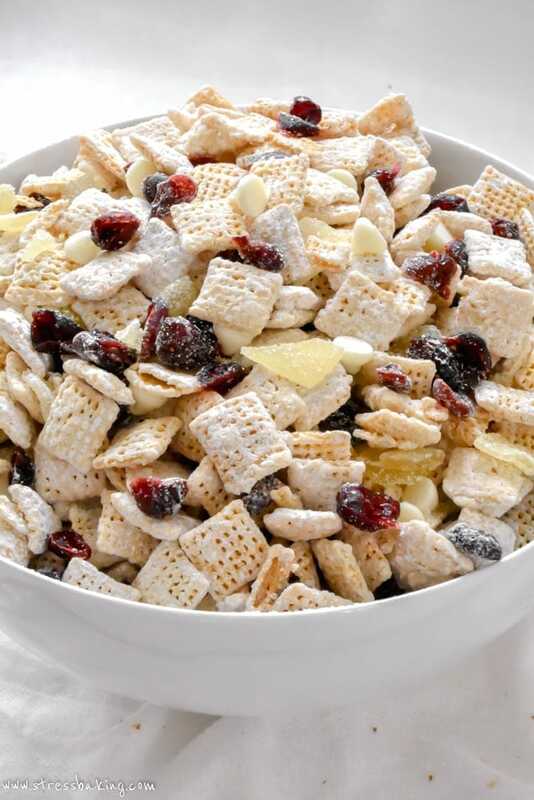 Love a good festive snack mix during the holidays! 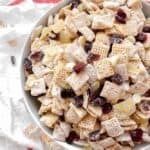 A great snack for the holidays for sure! 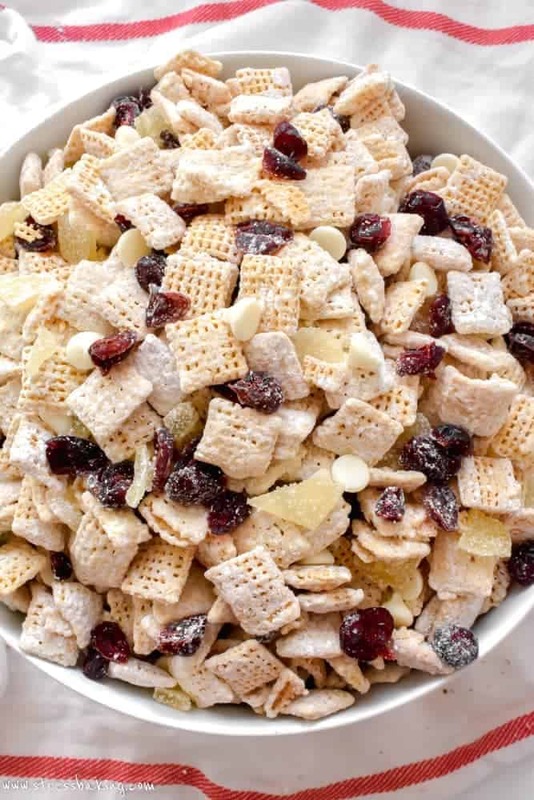 I love the crystallized ginger pieces that you added on top of the cranberries and white chocolate chips. I’m so intrigued by the crystallized ginger in there! I’ve never had a cranberry bliss bar (I don’t drink coffee, so I never bother to go to Starbucks) — is ginger a prominent flavor in “cranberry bliss”? It sounds so good! What a wonderful blend for a holiday snack! 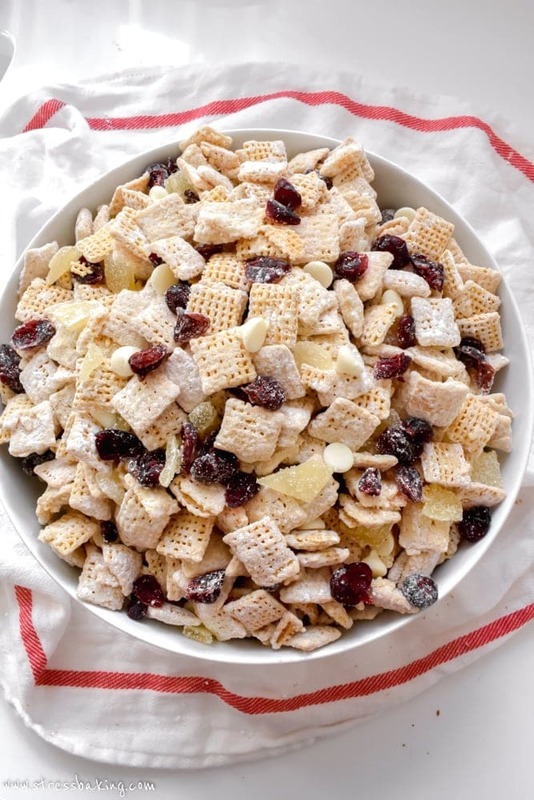 I love everything you added into your puppy chow! Oh wow..I am sure my kids will go crazy for this! all the holiday flavours are just so amazing in this recipe. This sounds so festive and so fun. My kiddo loves to snack and I bet he will be thrilled when I make him this. I’m saving this recipe to try. Beautiful mix of flavors. I love it. Oh what a timing, I have my puppy chow recipe ready to be posted and I see yours now. Perfect for holiday season. Looks absolutely gorgeous!